Franken initiated L.A.’s long-running Sunkist Track & Field meet in 1960 as the first indoor track & field meet on the West Coast. He also set-up the first indoor meets ever held in San Francisco and San Diego. 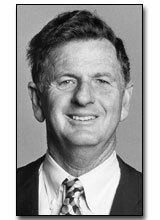 A graduate of UCLA, where he was sports editor of the Daily Bruin, Al was the Los Angeles Lakers first public relations director when the team moved west from Minneapolis. Franken helped develop the Kinney High School Cross Country Championships into a major national meet. He was actively involved in assisting the television coverage of the 1984 Olympic Track and Field program. He is also known for creating media-arousing promotions, such as offering $500,000 to an athlete who broke a world record. For 22 years, Al handled public relations for the Los Angeles Open Golf Tournament, and was in charge of advertising and public relations for the Los Angeles and Long Beach Boat Shows for many years. Other promotional assignments include the Virginia Slims and Volvo Tennis Tours, and he organized the first Evel Knievel jump--the stunt that led to the daredevil’s worldwide fame. Al founded Franken Enterprises in 1952 and World Class Sports in 1982 to promote and market the sport of track & field. He has been honored with election to the Los Angeles Coliseum-Sports Arena Hall of Fame.